Enjoy accessibility wherever you go when you invest in a suitcase ramp that be folded up and carried with you! These compact ramps are especially designed to be easy to lightweight and easy to transport so that you can overcome any mobility obstacle and safely travel around your home or around town! 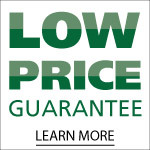 Order from US Medical Supplies of Lexington and you will also enjoy our free shipping and Low Price Guarantee! AmeriGlide suitcase ramps and EZ-Access singlefold ramps are covered by a 3-year limited warranty. Prairie View (PVI) single fold ramps are covered by a 1-year limited warranty.